When you look at the photos of my sister Cat and me at Pamukkale you will probably wonder in bewilderment what kind of bizarre Siberian detour did the twins take! Pamukkale felt like a detour, not just from Turkey but practically from our planet. This World Heritage Site is a rare spot on earth where hot springs, travertine terraces and Greco-Roman antiquities converge. 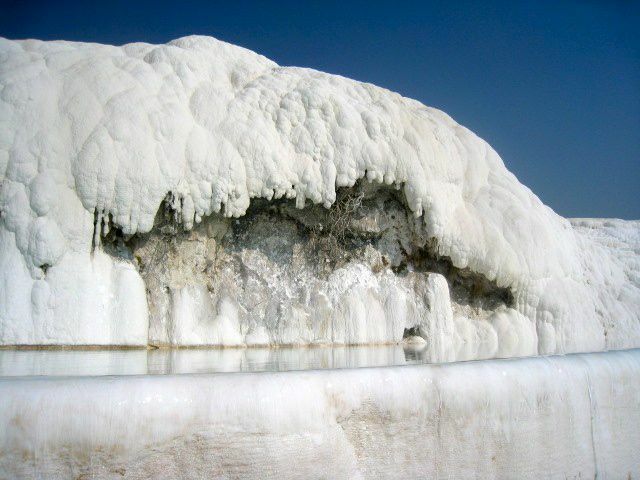 In Turkish, Pamukkale means “cotton castle,” but snow castle more accurately captures the mountain’s deceptively arctic appearance. 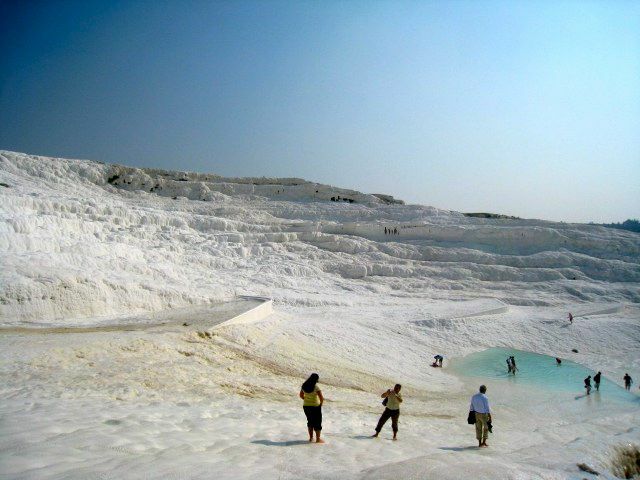 At 525 feet high Pamukkale is really only a big hill whose stark white cap calls to mind an alpine mountain as misplaced in the surrounding green valley as a shiny skyscraper would be in the Alps. The illusion of snow is actually travertine, a type of limestone created by a rapid precipitation of calcium bicarbonate originating from hot springs. Cat and I foolishly dawdled away the morning in the insignificant small town, allocating only the afternoon to Pamukkale. What were we thinking? 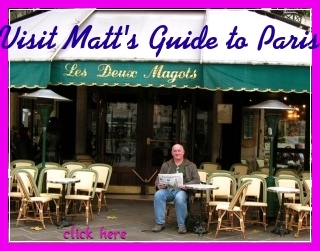 We had no idea what a stupendous experience awaited us that merited an entire day. After lunch we climbed the hill to Pamukkale’s ticket booth which is where the pavement ends and the travertine begins. There’s no entry gate or turnstile, just a long bench where visitors must take off their shoes and socks. 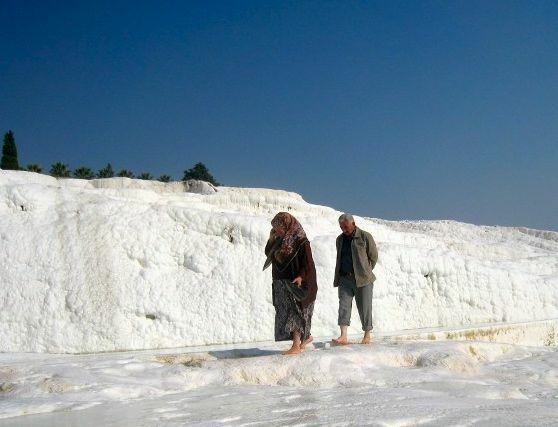 To protect the crystalline travertine terraces everyone is required to walk around barefoot like pilgrims at a holy site. There are no lockers so you have to carry your shoes. We stuffed ours in our day packs which were already full of extra clothes to wear in our not unreasonable, albeit mistaken, belief it would be cold up there. The calcium deposits make for a coarse surface, so unless you are a Tarahumara Indian, those of us with tender soles were trodding daintily as if on a pebble beach. 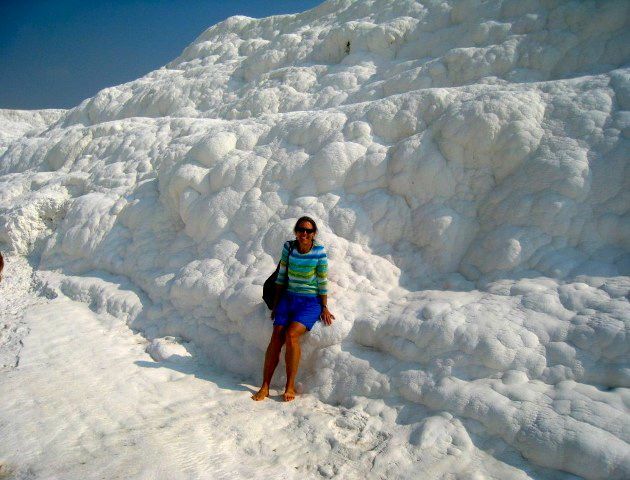 And you’re also beguiled into walking slower because Pamukkale resembles frozen tundra, yet the ground is not ice but calcium and it’s not slippery. What would normally be a 10-15 minute hike up the hill took Cat and me almost two hours. Our glacial pace (no pun intended) was slowed partly by the calcium gravel but mostly by our lingering at the glistening pools of natural thermal water situated every ten to twenty feet on the terraced hillside. Although they look like infinity pools where polar bears might frolic, the water temperature is tropically warm. Sun rays bouncing off the white terrain add to the heat. Pamukkale’s pools aren’t as hot as Iceland’s famous geothermal springs but the advantage is a winter wonderland backdrop without the frigidity, sort of like being in a temperate version of the South Pole. Our bare feet sought refuge in the pools’ smooth silt floors where wading around feels as soothing as walking on a silk carpet. You can rub the floor’s soft clay all over your body to enhance the water’s therapeutic properties. A spa moment looked so tempting but since we neglected to budget our time, we had to restrain ourselves from mud baths in order to make it up the hill before closing hours. We watched others smother themselves in the white clay, clowning around like Halloween ghouls. The pools lower on the hill were practically vacant, although in high season all the pools are probably overflowing with tourists. 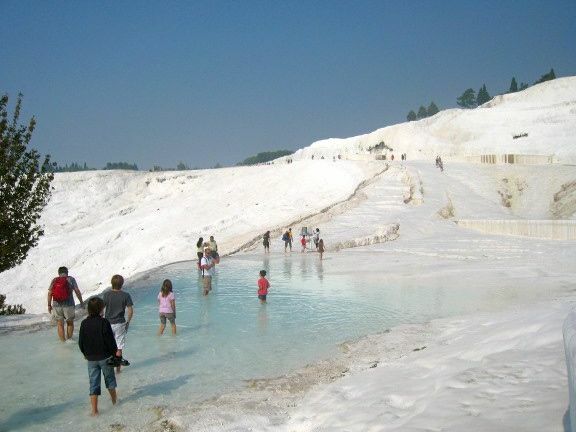 The upper pools were more crowded because the coaches take tourists to Hierapolis where they enter Pamukkale from the archaeology site’s entrance. These day trippers either don’t have the time or the patience to reach the lower pools which is how we were able to loll around in several pools by ourselves undisturbed. Unlike the pristine lower pools, the higher pools were afflicted with a green alga that we blamed on excess bathers although a geologist might offer a sounder explanation. 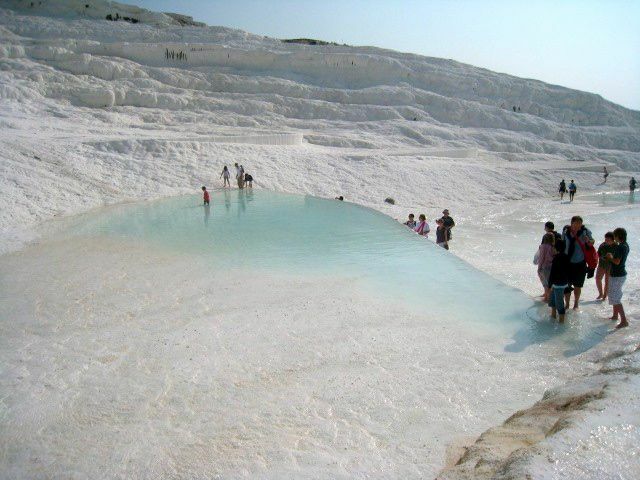 One or two pools were empty in a manmade effort to cleanse them and then they get refilled by the thermal water flowing from the seventeen hot springs located atop Pamukkale. I was astonished that people are allowed to trample around this precious place and felt that it should be more protected, such as, implementing a daily quota. But even its present unlimited access is a monumental improvement from the days when hotels commandeered the summit and a road cut right through the terraces allowing motor vehicles to desecrate the white slopes. When Pamukkale became an official World Heritage Site in 1988, as if the declaration were conditional, the hotels and road were removed. Usually Cat and I are consummate researchers and have pretty much figured out ahead of time where and what to see at a destination. We failed ourselves at Pamukkale. 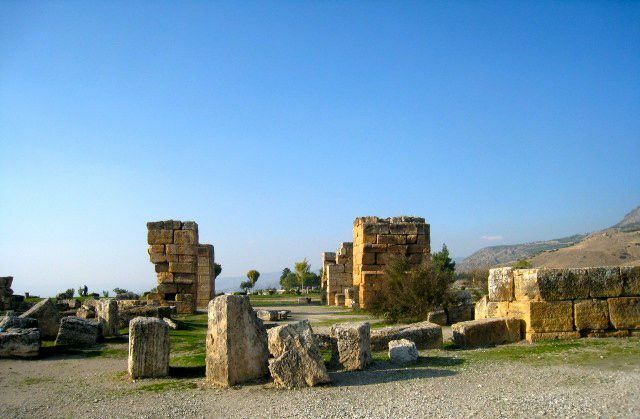 Once we reached the top of the hill it became apparent that Hierapolis was a much vaster archaeology site than we realized and that we could never conquer its contours within the remaining time we had. We put our shoes back on (because there’s no travertine at the very top) and checked out a few ruins before heading to a modern building, a spa complex, which holds one huge outdoor thermal pool known as the Sacred Pool. 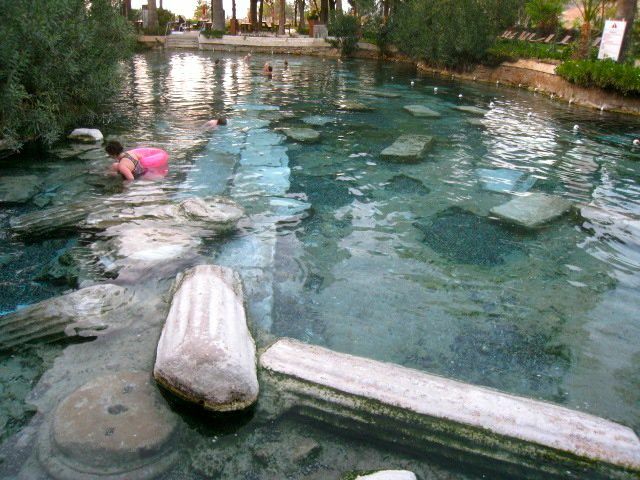 For centuries people used to come to Hierapolis (“holy city” in Greek) to bathe in its many hot springs where temperatures ranged from 95 to 212 degrees Fahrenheit. 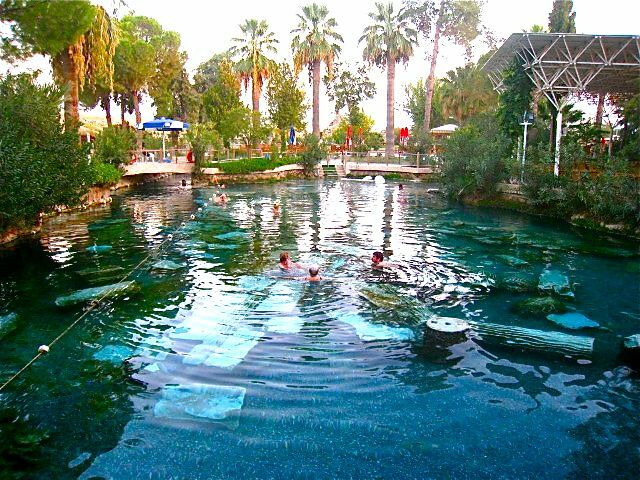 The Sacred Pool is also called Cleopatra’s Pool because the Egyptian queen is said to have swum here. During our travels Cat and I have experienced some amazing hot springs (such as the hot and cold waterfalls an arms length apart in the Amazon) but the Hierapolis Sacred Pool has to win an award in the Most Extraordinary department. An earthquake caused Hierapolis to fall to ruins and now some of the remnants of the ancient city litter the thermal pool like an underwater museum. 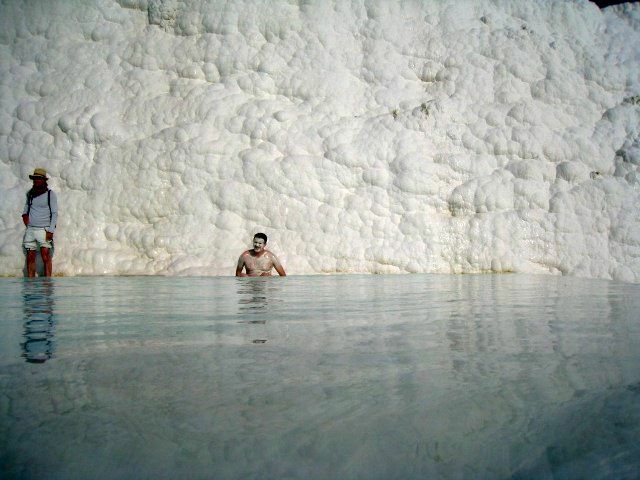 Imagine swimming in warm healing waters where you float between fallen Ionic columns and wade over the white marble slabs of a 2,000 year old Roman Temple of Apollo. Hierapolis is where heaven and earth collide. Cat and I swam under a bridge making our way to a more isolated wing of the pool where iron bars stopped us from further pursuit. Who knows how far the hot springs continued beyond the gate? There was only one other person there, a sixty-ish woman who seemed to have stationed herself in this corner of the pool for quite a while enjoying its serenity. We struck up a conversation and learned that Angelika is a German professor who specializes in ancient Roman theatres and had spent many formative years in Izmir where her father was either a diplomat or affiliated with NATO. 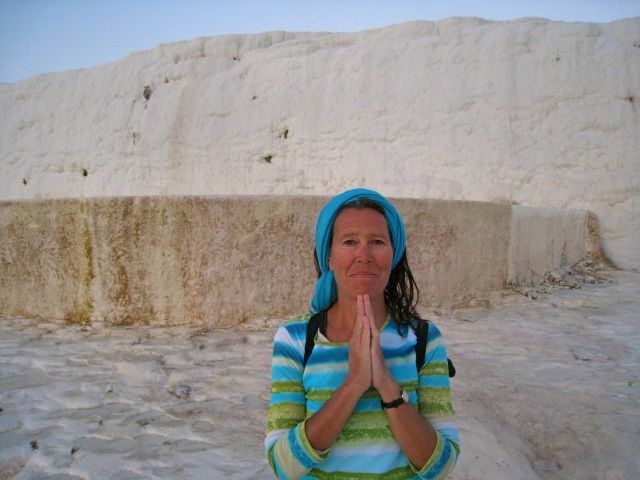 We both instantly sized her up as fascinating company so when she told us this was her last night in Pamukkale after a three week stay bathing daily in the thermal waters, we immediately invited her to dinner. That evening Angelika proved to be charming when telling tales and illuminating on all things Turkey. She got bonus points when we learned she is friends with Anneliese Peschlow-Bindokat, the German archaeologist who introduced Westerners to the prehistoric rock art of Kapikiri. Needless to say, Cat and I are now email pen pals with Angelika. The Sacred Pool’s calcium-magnesium sulfate waters are said to help treat a host of ailments including heart diseases, hypertension, rheumatism and skin problems. Drinking the water is good for the kidneys and digestive maladies. The curative waters are but one feature of the spa complex. For the equivalent of nine U.S. dollars you can spend two hours in the spa -- with a capacity of 6,000 visitors it’s unlikely you’ll be detected if you stay longer. For a dollar you can rent a locker and use the changing rooms. The facility offers a variety of services, including massages, aromatherapy, facials and a weird exfoliating treatment using Dr. Fish. That’s the nickname for a species of fish called garra rufa who feed on dead skin cells. Cat and I couldn’t resist testing it out. We were instructed to sit down in front of a tank of water, calf-high, and submerge our feet. The tiny critters immediately began nibbling on our skin causing us to giggle like silly schoolgirls. The tickly sensation lasts about a minute and then you get used to it. After twenty minutes we were ready to pay for another round except it was now closing time and we had to delicately skedaddle down the travertine terraces. In hindsight I realize that we had squandered the morning in the uninspiring town of Pamukkale. But not knowing what lay ahead, we had regarded our hours as productively spent. During our morning run we noticed that it was Pamukkale’s market day. 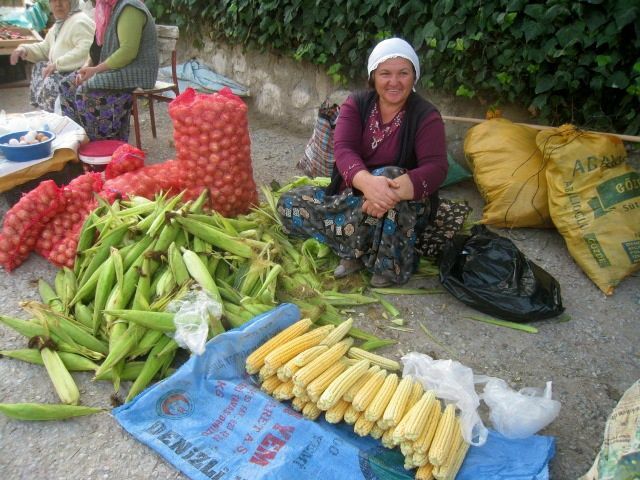 Our quest for fruit turned into an entertaining cultural exchange with rural Turkish farmers. The walnut seller saw us trying to crush the shelled nuts we bought. Chagrinned as if he hadn’t serviced his customers properly, he took over and then proudly presented us with a bag of walnut pieces. One man sold yogurt out of a big wooden barrel which we surmised meant his product was fresh and homemade. It wobbled in the plastic baggie he handed us. Some female vendors sat on the ground as if at a picnic. We saw a couple of Europeans but otherwise we were the only foreigners so we attracted a lot of attention and smiles especially when we awkwardly negotiated our purchases. After the market we got waylaid on the way to Pamukkale when we observed a young girl hand rolling dough to make a Turkish version of a crepe. She worked very proficiently and reveled in our fascination of her. So Cat and I stopped to eat lunch at her family’s restaurant and then lingered longer than necessary because they seated us in a tree! We climbed a ladder to reach a platform in the branches which held a table and pillows on the floor. We idled there for quite a while entranced by the disconcerting view of the snow capped mountain seen through green leaves. Lounging aloft a tree seemed like a positively pleasant way to spend an hour or so, except, however, when we belatedly discovered that gazing at Pamukkale from afar can never compete with the rapture we experienced strolling within its surreal winter landscape. Next time we’ll do our homework.